Be the first to share your favorite memory, photo or story of Ted. This memorial page is dedicated for family, friends and future generations to celebrate the life of their loved one. 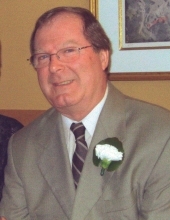 Peacefully passed away at his home in Waterdown at the age of 77, on Thursday, January 24, 2019. Beloved husband of Evelyn (nee Snell). Loving father Tim (Nancy), Todd (Brenda), and Tammy. Cherished grandfather of Brendan, Matt, Colin, Hannah, Cody, Amanda, Austin, Michael, and Josie. Ted was the proud owner of Flamboro Mix and Brew.In keeping with Ted’s wishes cremation has taken place. Memorial Visitation will be held at KITCHING, STEEPE & LUDWIG FUNERAL HOME. 146 Mill St. N., Waterdown on Saturday, February 2, 2019 from 2-5 p.m. If desired, as expressions of sympathy donations to the Canadian Cancer Society would be appreciated by the family. "Email Address" would like to share the life celebration of Ted Dredge. Click on the "link" to go to share a favorite memory or leave a condolence message for the family.